My love for breakfast has been well documented here. I’m down for almost anything, almost every morning. Οn week days, I like to keep things simple with quick smoothies, full of goodness and flavour, or crunchy and perfectly sweet homemade granola, a nutty bar or hot and creamy quinoa. Some days though call for eggs and I’m so down with that as well. Creamy and pretty? Yes, please. Saucy & spicy? A thousand times yes. And let’s not forget chocolate: in a pudding, or spread on warm crusty bread or mixed with booze for the perfect morning warmer. I’m in for all of the above. I’m also in for french toast. Man, I’m so in for that. Need I explain? Bread slices dipped in a creamy, eggy mixture, along with spices and vanilla, and soaked until soggy and ready for a hot buttered pan. 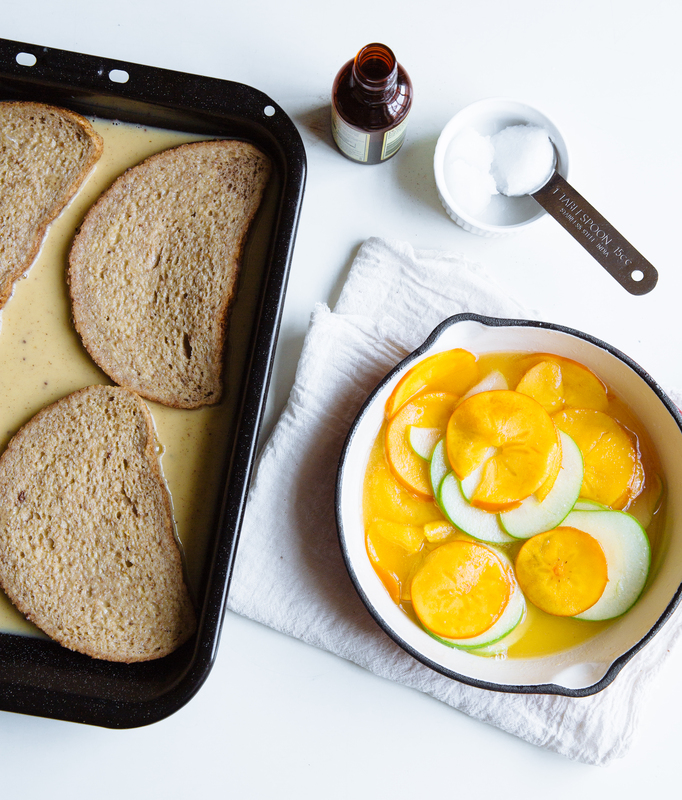 Perfect on their own (and maybe a good drizzle of maple), sure; but even better with apple and persimmon slices, cooked with honey and coconut oil, tucked between these bread slices AND topped with a good drizzle of that sweet coconut syrup. Breakfast, you and me, let’s do this. Choose the right bread- it is after all your main ingredient: brioche, challah or tsoureki are excellent choices, as is good quality sandwich bread. Avoid loaves with thick crusts (they won’t soften up enough) or holes (the custard won’t cling on to them properly) and preferably go for stale. If you don’t have stale bread in hand, leave the slices you’re going to use on the counter the night before. Combine the eggs and milk well; you want a creamy mixture which will cook evenly. Many recipes call for the addition of cream for extra flavour and texture, but I’ve found that milk alone, or even non dairy alternatives, work just as well, provided they are well mixed with the eggs. Keep your pan well-greased with butter and the heat to a medium. The second batch will however keep slightly faster than the first, so keep an eye on it and adjust accordingly. Combine the eggs, milk, vanilla extract, ground cinnamon and salt and beat well until combined and creamy. Set aside. Slice the apple and persimmon very thinly using a very sharp knife or mandolin- carefully. Toss with a couple lemon squeezes and place in a sauce pan or skillet, along with the honey, coconut oil and butter. Cook over medium until the honey, oil and butter are melted and slightly thickened. 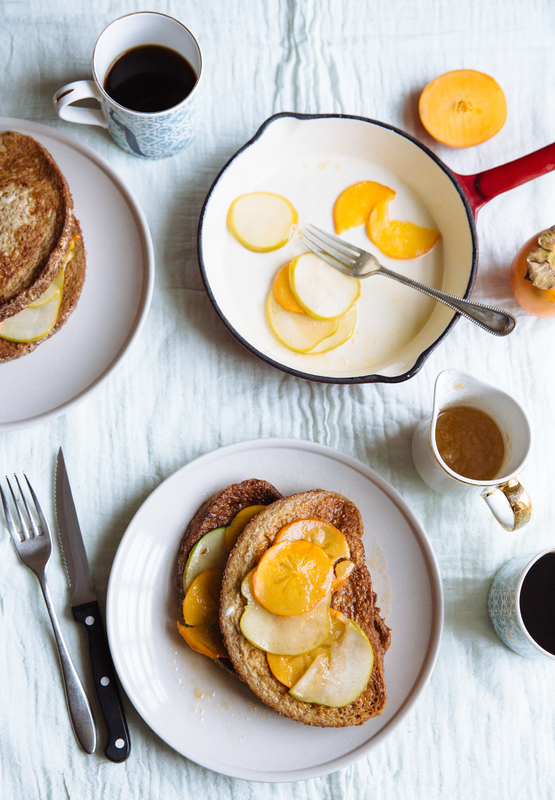 Set aside while you make the french toast. 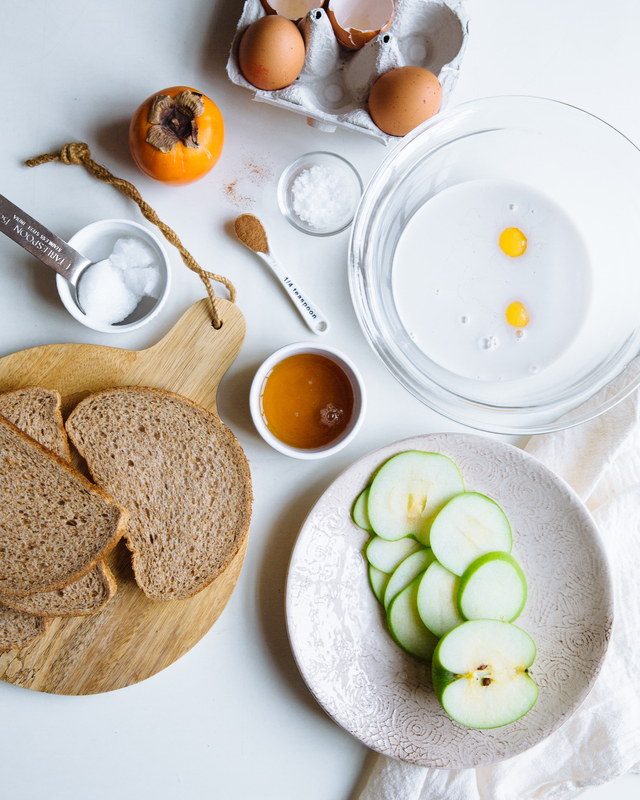 Place the bread slices in a shallow pan and pour the egg mixture over them, so that they are fully covered. Allow them to soak for 2-4′ on each side. Melt one tablespoon butter and one coconut oil in a large pan over medium heat. Lift two bread slices from the pan, allowing any extra liquid to drip back to the pan, and place on the hot pan. Cook for about 5′ or until golden brown and then turn to cook on the other side too. Repeat with the remaining two slices (the cooking time required may be less). 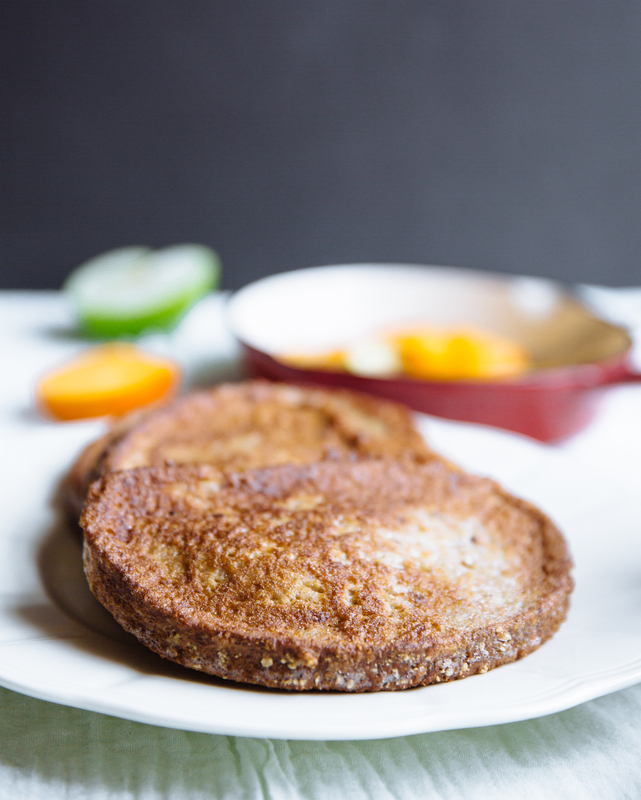 Serve with sliced fruit between the bread slices and a good drizzle of the cooked syrup. Love persimmons! 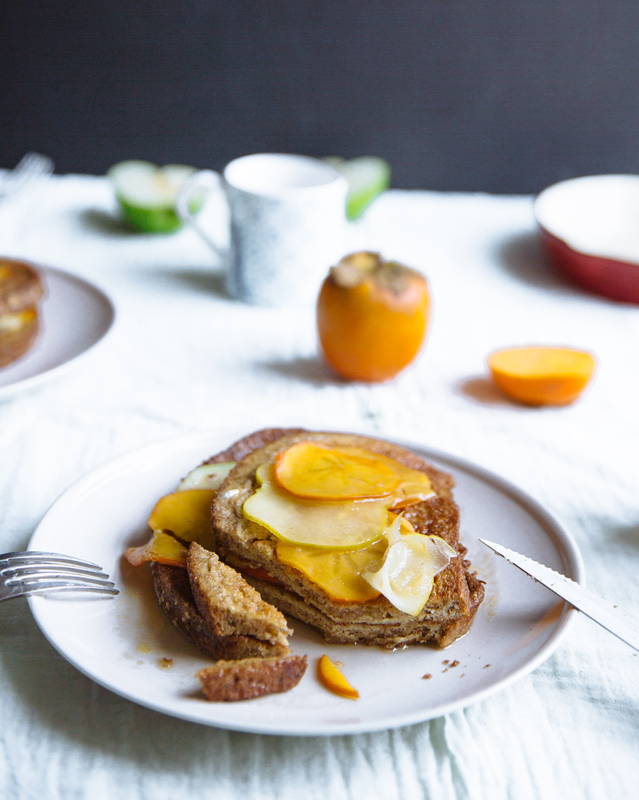 This breakfast idea looks perfect!